Painted this black with chalk paint followed by a polyurethane spray for my stair landing. 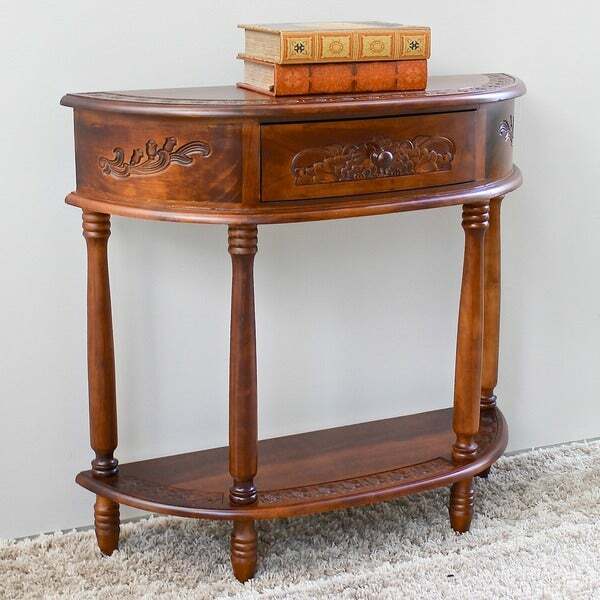 Classic charm and sophistication are at play in this darling half-moon hall table. Intricate designs on hand crafted hardwood are finished in a rich walnut that fits in wonderfully with most decor. The lovely and ornate shape gives it a special presence in the home perfect for display. Dimensions 37.0 In. X 14.0 In. X 15.0 In. This is a beautiful piece of furniture, just what I wanted. Unfortunately, after I attached 3 legs with only 12 rotations for each leg, I had no luck attaching the 4th leg. I turned and turned the 4th leg & eventually realized that the wood was stripped. There was no way I could repair that myself. Also, the bottom shelf had a crack in it that ran almost the width of the table; I could have lived with that. There were minor knicks in the table, those could have been touched up. I telephoned the toll free number for Overstock and the customer service person was gracious and very polite and gave me instructions for returning the table to them. The main reason I returned the table to Overstock was the problem with the leg. If you have a handyperson around in case of a problem with the product, take a chance & order the table. It really is a lovely item!! Purchased this for my entryway to sit along an angled wall. This was the perfect size at a very reasonable price. I purchased this along with the rectangular table and they complement each other nicely. Table is sturdy enough for a decorative piece and the carved top and drawers give it a nice look. It is a lot lighter (weight) than expected, but I don't have an issue with that. The bottom shelf is perfect for a small plant. The drawer does not have a stop, so careful when pulling it out as it will pull all the way out. No big deal for a drawer that is rarely opened. The color is as pictured. International Caravan Carved Wood Half-moon Hall Table. Beautiful half moon table. It was the exact right size and fit the small space in my kitchen. I am so glad I purchased this table! I have been looking for something that would fit in a narrow entryway and that would somewhat match with a large wall mirror I have. It is only 11 inches deep and the half moon shape is perfect! I have had many compliments on it. After reading the reviews I was a little apprehensive after hearing about the wooden screws on the legs, assorted dings and other descriptions of imperfections by a small percentage of reviewers. I found the table to be of good quality and exactly as pictured...except as one other buyer stated it is darker and can be described as a very dark cherry. It was, however, a great match with my chocolate brown leather sofa and loveseat. The design on the legs must have changed as the connections were not wooden threads but steel machine studs which screwed into imbedded nuts. The studs on the short bottom legs were crooked although when screwed in the lower table surface accomodated the bend and assembled it looks great.All in all I really like it and the carving is very nice and I think the table has good proportions and I like the fact that it is only 11 inches wide which is ideal for the walkway where I have placed it.You will not be disappointed unless you really wanted the lighter color shown in the picture. This half moon table is exactly as presented on the Overstock website. The reviews I read were right on the mark. It said the table was great for a small area (10 inches deep), easy to assemble, packaged very well, and mailed quickly for a very little sum. I always check Overstock first for my shopping list! 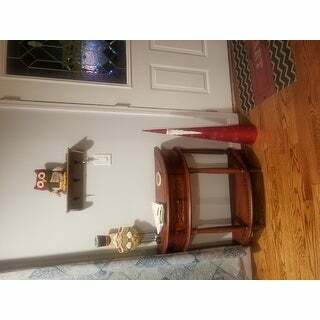 Well crafted hall table with nice wood carving on top. Love it! Arrived in just two days! Easy to assemble; just screw on the legs. Goes great in the guest bathroom and holds lotion, tissues, towels, etc. Can't say enough good things about this table...try it, I believe you'll like it too! The unit is just what we expected; attractive and a good value. However assembly required removal and reinstallation of three of the four table leg attachment screws to complete assembly...not a big job but something not everyone possibly could do without damaging the unit. very, very nice piece. picture does not show how pretty carving is. assembly a cinch! this is defintely a good buy, and a perfect fit for the front hall spot it was purchased for. I was a little unsure if I should purchase. Saw other positive reviews and went for it! I am very pleased. Table looks even better than I expected. Beautiful color and very lovely carvings. I am very happy I purchased it. You will not be sorry. I had no trouble assembling the table...took minutes. the table is beautiful and looks even better than the picture. The detail work on the top and bottom shelf are well done and add so much to the look of the table. I needed a smaller table where I placed it, and it was perfect. I have added a mirror above the table with an accent light overhead. I am really happy with my purchase. It was easy to put together and looks great in the area I placed it. Sitting in my foyer, guests always admire this piece of furniture. I was going to distress white but I love it so much I chose to leave it as is. I'm very happy with this item it's exactly as advertised ,it's a solid wood very attractive. I have receive many compliments I have it at my entrance. Two of the legs would not screw in deep enough. I had to glue two of the legs to the bottom of the table. There also was a nick on the bottom shelf that I had to color in. Looked great. Only problem was one of the of legs had stripped screws. Otherwise it was a great value. Love this entry table. It was very easy to assemble, probably less then 10 minutes and it had no drilling nessecary. It has a rich redish tint to it. Beautiful table and the style is exactly what I wanted. We use this in the front entry and the drawer is great for keeping small things that can come in handy as you walk out the door. Love it. I love this for my entryway table. Love this table, perfect little table for our entry way. Small drawer is perfect for keys. "Where is shipping coming from "
Not sure where it was manufactured but assume it was a third world country. Asthetically nice piece but of poor quality. Top piece is cracked and not worth the hassle to send it back. This will ship from one of our warehouses in the US. "Is this table finished on the back side?" "the discription claims the product has 2 shelves but the picture only shows 1. What is accurate the description or picture? " The table has 2 shelves. "Is this table available in another color? Could it be special ordered? Tony"
The International Caravan Carved Wood Half-moon Hall Table is not available in another color, we are sorry. No, the table cannot be special ordered. Hello assemblyquestion, thank you for your inquiry! The assembly required is to screw in the legs into the table. Hope this helps. Happy shopping! Took me 5 minutes only.